Following the class Basics for ATIAM, the training continues with Musical Acoustics, Musical Signal Processing and Computer-Music. At the same time, students work together in small groups, combining several scientific domains in a single research project applied to music in the class Projects and Musical Applications. These projects are the students’ first research experiences in the fields explored during the program. Students also follow a class on their future careers with a focus on the specificities offered by the ATIAM program. During this class, students work on their scientific English vocabulary as well as adapting to working conditions in their chosen domain. The year ends with a 5-month internship in a professional research laboratory. This teaching unit aims to provide the basics enabling the different teaching units to fully develop, as well from a scientific point of view as from the general knowledge of Twentieth-Century music and musicology. The first part of this unit provides a harmonization of different levels with respect to acoustics, signal processing and informatics. 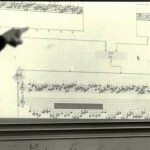 The second part provides an introduction to XXth Century music and musicology, by focusing in particular on Computational Music Analysis. The aim of this UE is to develop a good competence on the main scientific tools of musical acoustics, by enabling a deep understanding of musical instruments, going from physical acoustics and vibrations problems to the perception of musical sound. 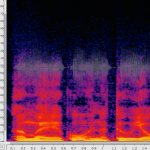 A good knowledge of some theoretical tools in acoustics (such as frequency/temporal response, Green functions, etc.) 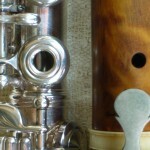 coupled with an understanding of dissipative mechanisms should provide the tools for studying the oscillation systems of musical instruments the coupling of the different elements which structure it, the control of the musical instrument by the musician, the diffusion of sound and its perception, also in a concert hall. This teaching unit covers the mathematical aspects of the signal and its representations, the theory of analysis-synthesis transformations of the signal, restoration and denoising and provides an introduction to source separation. More specifically, two types of signals are studied, the deterministic ones (Fourier transforms (TFD, TFTD, Fourier series, Sampling theorem, Filtering (causality, stability, …), Z-transform and recursive filters, Spectral observation and filter design, Resampling, efficient implementations) and random signals (Wide-sense stationary processes, Autoregressive processes, linear prediction). Other topics include Fourier-type methods (phase vocoder), Sinusoidal + noise methods, Source-filter synthesis, Nonlinear systems and Volterra series theory, Implementing a real-time processing application in FAUST, Frequency modulation, Karplus Strong synthesis based on physical modeling. The aim of this UE is to develop a good knowledge and competence of both computer-aided tools but also the romantic view on informatics which are relevant to music. This perspective embeds symbolic representations, logic programming and lambda calculus as well as programming languages (from functional to object-oriented). The student will discover these different symbolic representations of musical structures and the state machine theory through automata theory (used in computer improvisation), improve its knowledge in the pragmatic aspects of the midi format in music analysis and generation, and develop programming techniques for music (both real time and offline), up to distributed and concurrent programming. Finally, the current trend of big data and machine learning will be exhaustively studied through four sessions covering the basic concepts of Artificial Intelligence, up to the latest techniques of deep learning. 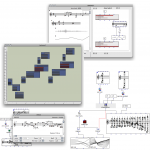 This teaching unit proposes some practical applications of acoustics, signal processing and computer science to the musical field. Its main objective is to enable the student to integrate the different competences acquired within the different scientific domains by applying them to a musical problem. Based on the project pedagogy, this unit will help students to work in a collective way by developing their competences in a specific personal direction. The contents of the projects are selected by the pedagogical staff in order to facilitate the mutual collaborations around recent research domains (see the list of selected projects on the right).